By far the best thing about the Cross in the Woods is the basement of the gift shop–it houses the World’s Largest Nun Doll Museum. The “museum” has dozens of glass cases filled–and I do mean filled–with dolls of all stripes and sizes dressed in Catholic clergy/nun gear. I’m especially pleased with the photo above! 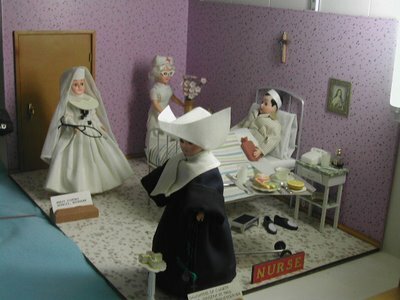 Dioramas always draw me in. 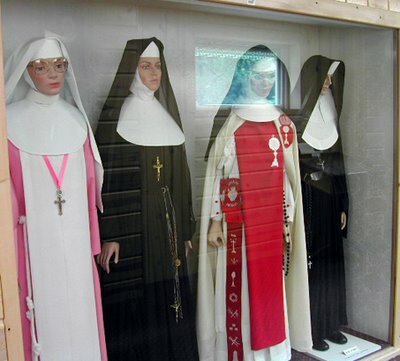 If you know much about dolls–or even if you have a strong working knowledge of pop culture–your enjoyment of the nun doll museum is sure to increase exponentially. Note the doll above? It’s a Robin Williams as Mork from Ork dressed in a monk/priestly costume. 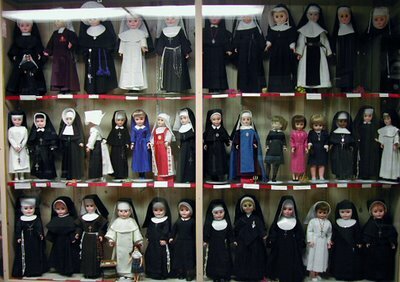 Here’s a sampling of one of the many cases filled with of baby doll size nuns. They even have mannequin “dolls” to show off full-size costumes. I might consider that white and pink number, it’s cute! Because I am a bad person, this display is a personal favorite of mine. Two priest/monks take two little boys camping. 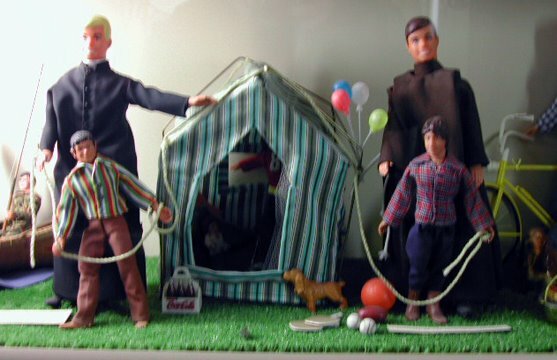 I love how Ken is directing his charge to the tent enticingly! C’mon in, little fella! Other dolls I recognized include Barbie, Charlie’s Angels and Donny Osmond. Fantastically bizarre and just creepy enough to make me want to go back and check it out. I heard they carried Jesus ashtrays at the gift shop but when I asked the chick behind the counter got really offended. Must have been before her time.